Three Fundamental Freedoms – Can We Have Rights in EVE? EVE players are not, habitually, compassionate people. Whilst they might display a great deal of generosity to confused newbies (something I knew from begging in fleet), the majority will not blink twice at scamming, freighter ganking and frankly uncivilised amounts of gate-camping. And that is fine – EVE is a sandbox, designed to be an anarcho-capitalist paradise. I’m not going to come in as some sort of shrill and outraged moral guardian. However, there do come certain events which, for want of a better phrase, outrage the conscience of mankind. One such event was the Yokai Federation leadership demanding players, often very new to the game, spend $100 in order to play. This brought public condemnation on Reddit from all sources, and further, a robust military response from a coalition of players. There was another similar event in June 2017, where scottmw15 enslaved about 30 newbies in a work camp deep in Russian territory – they were forced to rat and mine, and unable to escape, they either quit the game or worked on in misery. Only the coincidental intervention of a Goonswarm spy, and the subsequent commitment of an expeditionary force, saw these players freed. I am willing to bet that abuses like this happen every day in New Eden. We don’t hear about them because the victims are predominantly new players. They don’t understand that these actions are beyond the pale – and if they do, they don’t necessarily understand how to seek help and escape to a friendlier corporation. One example of this in action is the membership rates of the aforementioned Yokai Federation, with approximately 98% of players ceasing to play EVE after a time spent in it. The abusive policies carried out by Sara Somers, head of the Yokai Federation, drove players away from the game and made them less likely to engage with the wider community. So, to review: EVE players can be dicks far beyond accepted norms, with negative effects to both players and the game as a whole. When the community finds out about this, they do act – but it is unlikely that they always find out about it. The question now is simple. What can be done about this situation? I think that the most effective way to prevent this sort of genuinely abusive and poisonous behaviour is that players accept and enforce a basic code of ethics. The goal would be that if someone were to be found in breach of this code, then they are so effectively harassed, engaged and degraded that they cease said activity. Setting rules in EVE is a very difficult proposition. The easy solution, for one thing, of porting over a modern code of human rights, would be totally nonviable. 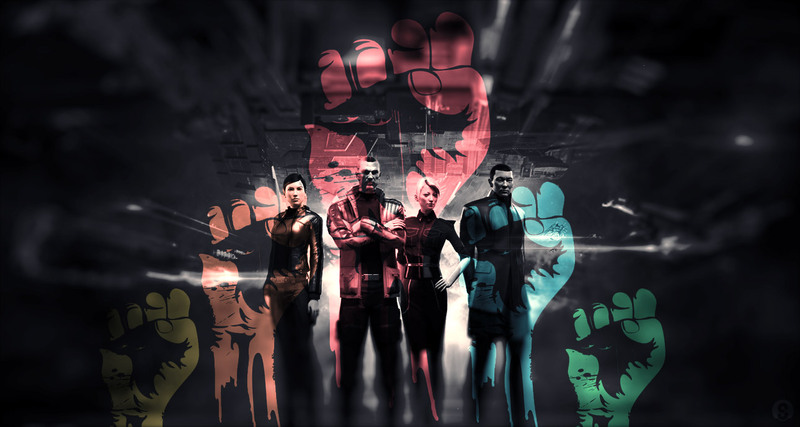 Moreover, there are great deal of things in EVE which are certainly legitimate gameplay – such as suicide ganking, scamming and mass theft – which is not pleasant, but not fundamentally abusive in character. This is not some sort of ban on CTAs and coalition wide operations. It is designed to ensure that the players like scottmw15 cannot exploit other players by placing them in an inescapable situation and then making them work. This is not some sort of ban on forum moderation. Nor should it be taken as an endorsement or incitement to hate speech. However, when alliances and corporations start massively censoring communications, compiling long lists of people players are not allowed to talk to and generally suppressing freedom of speech, action can be taken. EVE is fundamentally a capitalist game. Players are free to volunteer their resources to a cooperative endeavour, but they should not be ordered or compelled to do so in any capacity. This involves either in-game assets or money outside of game. These three freedoms are targeted to prevent outright abusive and definitely repressive behaviour without comprising the anarchic character of EVE. You will note that I don’t call for defences of high-sec miners, mission-runners or couriers. Their destruction is part of the game, and when undocking, they consent to potential death. This is of a different character to behaviour involving luring new players into poisonous and oppressive situations. So, to review: we should protect newbies and other players who can’t protect themselves. When doing this, we can stop or impede legitimate gameplay. Therefore, we should have three fundamental freedoms, as listed above. So, even in the unlikely event that people agreed to this in principle, how would we enforce it? Well, there are two levels at which I think enforcement could be organised. The first would simply be a group of diplomats from major coalitions in order to coordinate operations. When a spy, journalist or scout spots a rights abuse, they confirm it and decide on how to respond – ranging from warning people about the corporation or individual up to dropping capital fleets on them. The second level would be more complicated, and effectively demand an alliance of its own. It might be comprised of an enforcement unit, which undertakes direct military action (therefore relieving major coalitions of having to do this) and a resettlement unit which can ensure rescued players are able to find a safe home. This is ambitious – I make no excuses about that. However, I think that it is doable. EVE players have come together before to do immense good in the real world, donating over £500,000 to charity. I don’t think it is impossible for the community to come together in the name of protecting those exploited. Interesting read? Please consider supporting CZ via our Patreon. Hopeful Turtle started playing EVE after watching the ‘This is EVE’ trailer. He quickly decided to flee highsec and joined up with Karmafleet, wandering over to Delve to join the fight.